Fresh roasted Alaskan Halibut at the Seafood Peddler. With the start of spring comes Alaskan Halibut season at the Seafood Peddler of Sausalito. Growing up to 8 feet long and weighing in at 700 pounds the halibut is prized for its sweet flavor, flaky white meat and its versatility in the kitchen. The whole fish is delivered daily to the kitchen. 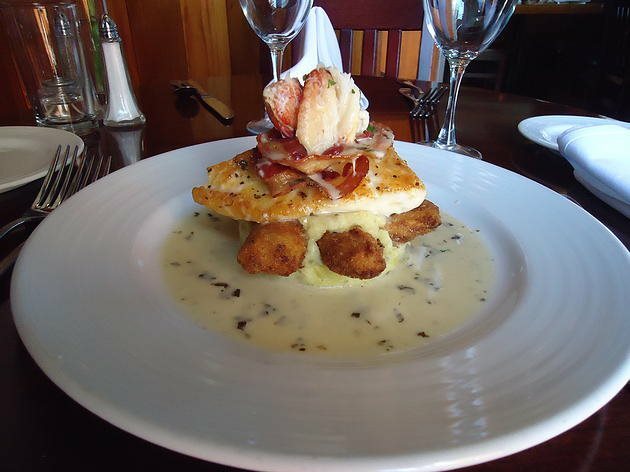 Chef Fidel serves a fresh roasted Alaskan Halibut over roasted Garlic, Yukon Gold mashed potatoes surrounded by a basil butter sauce topped with Smokey Pancetta and Dungeness crab meat with crispy baby artichokes. So why eat Halibut? With an increasing focus on eating sustainable seafood Alaskan Halibut has been rated as one of the best choices for sustainability. What makes a fish sustainable? Well it starts with how a fisherman hauls in their catch. Most Pacific and Alaskan Halibut fishing is limited to bottom long lining method. Suspending baited hooks close to the bottom of the cold waters of the Northern Pacific limiting environmental damage and minimizing accidental catch of other bottom dwellers.